Play store categorizes ES File Explorer File Manager APK 4.1.2.4 under productivity application. This application is indeed improve your productivity when using your Smartphone. Managing files on a Smartphone is not as easy as it goes in your computer. To support your productivity while accessing your file on Smartphone, you can use this certain file explorer application. The way this application works is relatively similar to file explorer in your computer. However, it has several cool features that you need to know. Those features are going to help you managing your files, including easily transfer to your personal computer. Transferring files from your internal memory into your memory card vice versa will be easier than ever. The main feature of this free file explorer application is file managing feature. It helps you to organize your files. Several basic functions such as copy, paste, select, cut, share, erase, send, and hide are also available for your convenience. Moreover, this application also has control over other application. You can easily categorize, uninstall, or creating shortcut into your android home screen. The most notable thing about this application is the remote file manager application. It will allow you to activate and manage certain files on your Smartphone through your personal computer. 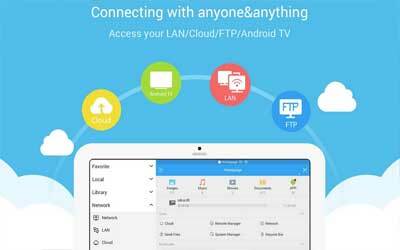 Besides provides easy connection into personal computer, it also has feature that allow you to transfer files on various android device via Bluetooth. When doing multitasking, sometimes you find your Smartphone laggy. It happens due to the overuse memory of your device. This application has powerful feature to shut down any application by a single click. This process is going to free your device memory and make it run smoother. In order to free more memory usages, you can utilize the cache cleaner feature of this application. For those of you who need easy access of your files on the Smartphone, you are suggested to install ES File Explorer for Android.